Been quite some time since I sent up an update, so here goes! 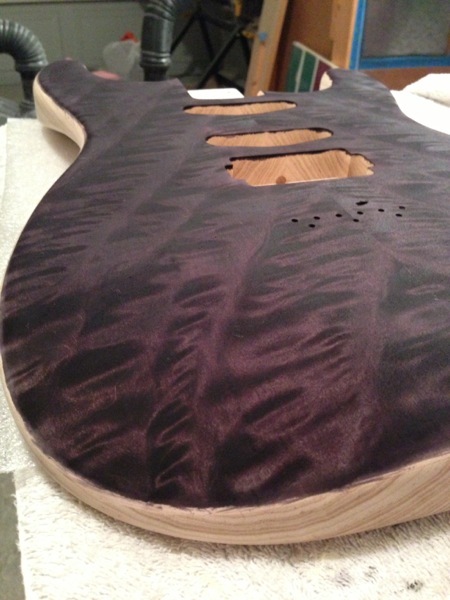 The purple catfish and white 624 are closer to completion and the next batch of updates will focus on them. 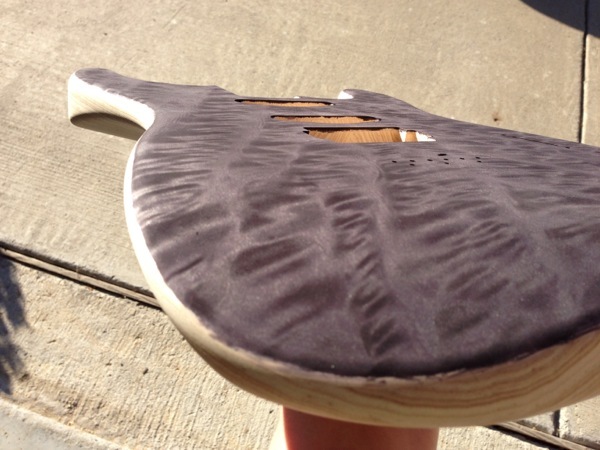 The Catfish body needs to be sanded and buffed, and the headstock is about to be sprayed. 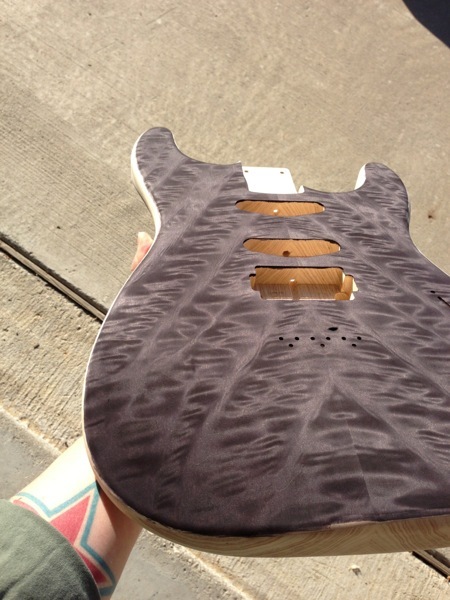 Then it's frets and assembly. The white 624 needs a bit of buffing and then assembly; although I added some detail to the stinger on the back of the headstock as you can see below. 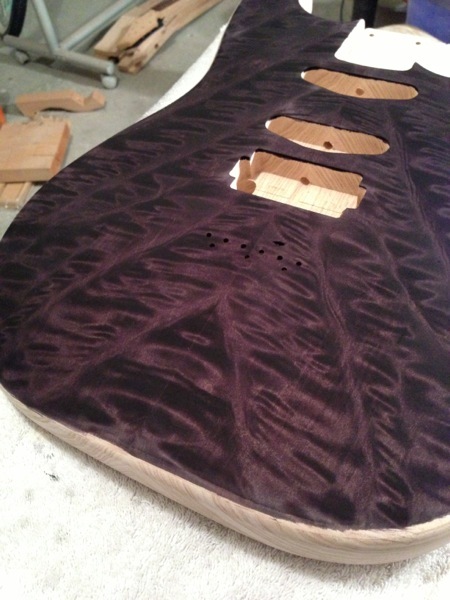 Once those are complete, the natural mahogany 624 will be the next one completed - the frets have been installed (but need to be dressed), and the body has been receiving some light coats of Tru-oil. 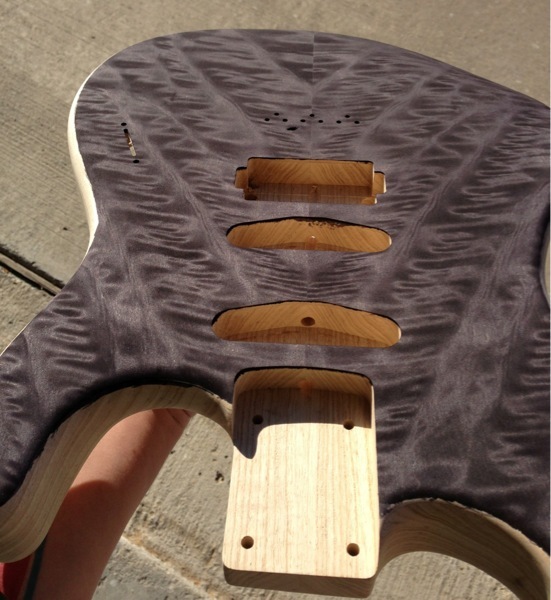 The backshape of the neck will be dialed in, and then it's assembly time. The first of the '71 prototypes is ready for finishing and assembly; it'll go to Mike Learn for that. 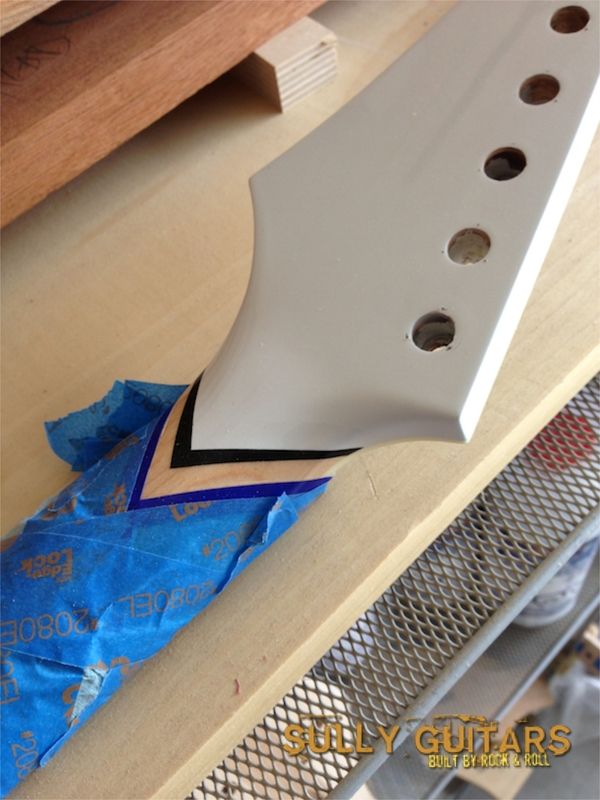 The plan is just to have clear gloss on the body, black on the face of the headstock (maybe a dark trans black, we'll see). 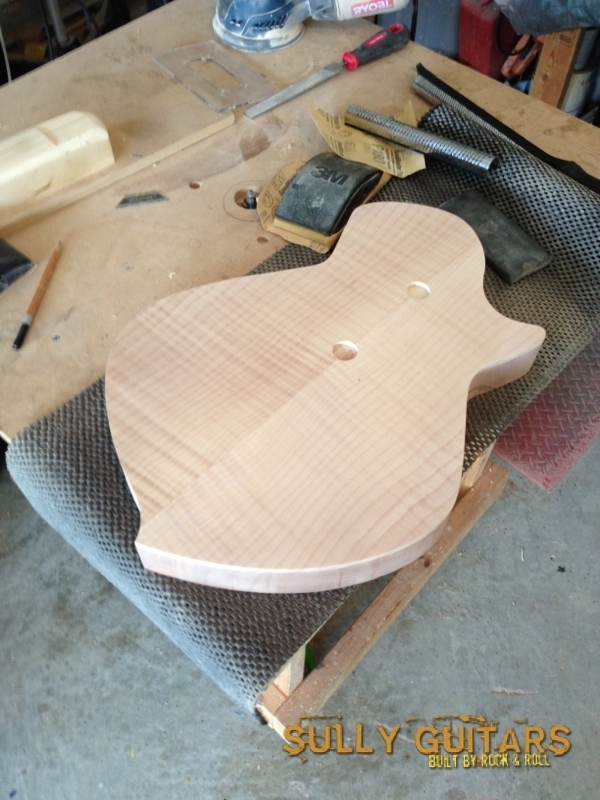 A second '71 prototype body has been started - mahogany + flame maple top. Current plan is a 2 humbucker setup, nickel wraparound bridge. 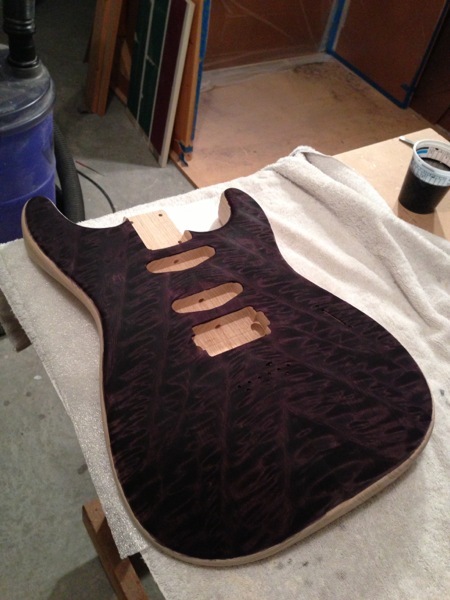 My initial finishing idea is a deep trans red on the face of the body, with oiled back and sides, but we'll see. Haven't finalized neck specs yet, but will letcha know once I do. Since I had some miscellaneous bodies and necks sitting around, I decided to slap this '92 together. 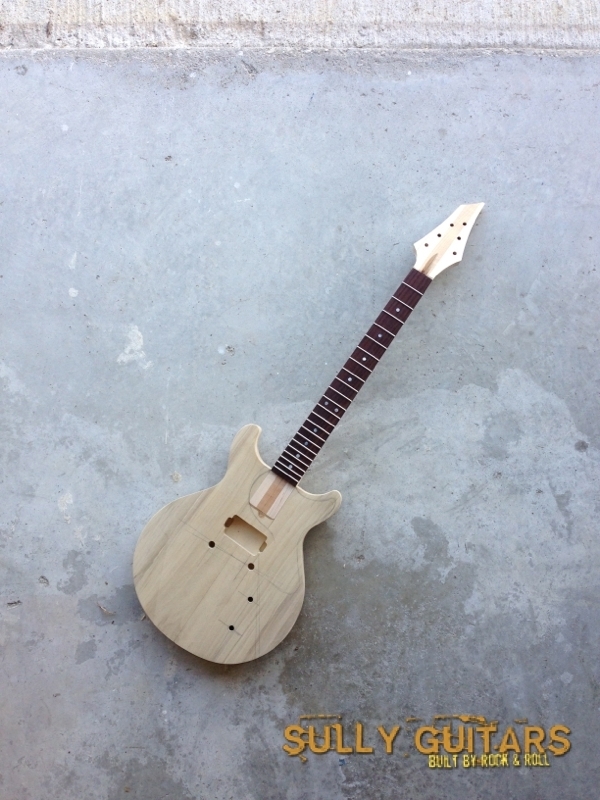 Poplar body, maple neck, rosewood fretboard with a 25" scale. As usual, the frets are stainless steel. Pickup should be a Seymour Duncan P-Rails so that I can get true humbucker, P90, and single coil tones from one guitar. My initial color idea will be a light blue (in the neighborhood of sonic blue), nickel or chrome hardware and a checkerboard pickguard. This one may be up for grabs, but its completion is on the back burner, as there are other priorities. Been itching to get the purple angel step maple topped Catfish clear coated, which will happen soon, so stay tuned on that. 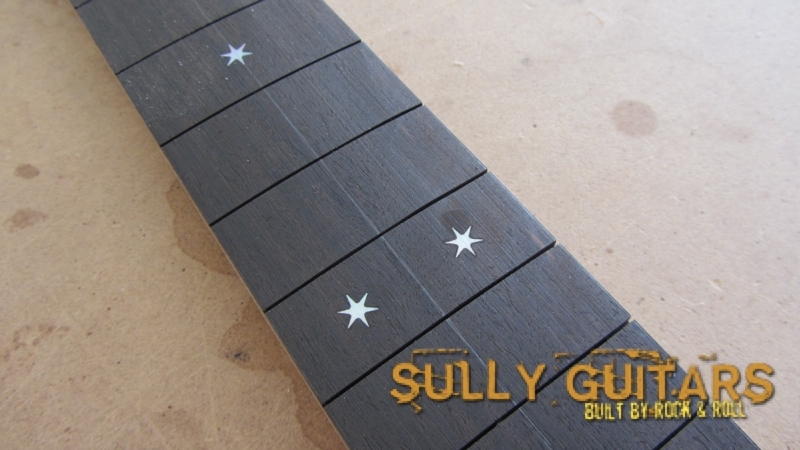 Also trying out some new inlay ideas that you'll see in the future, but one of them incorporates the six point star found on the Chicago flag. A second Chicago Raven will be made (with an Aero headstock), and the customer and I decided to incorporate the motif into the fretboard. Should be neat! 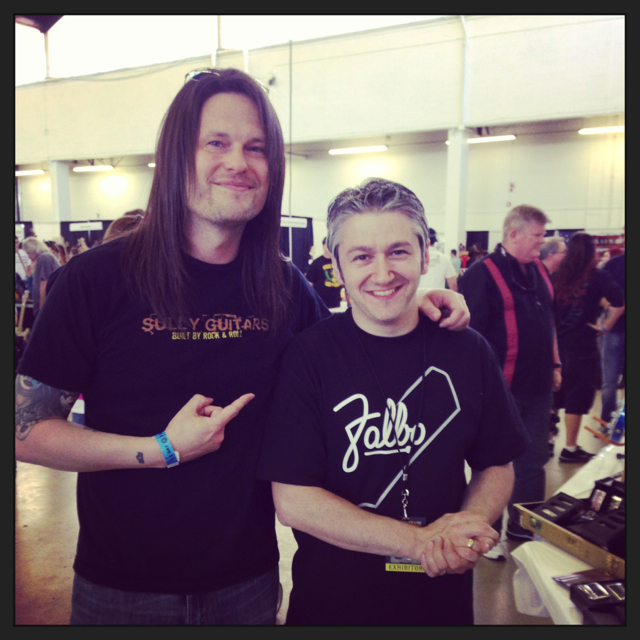 Alongside of that, Mrs Sully and I went to the Dallas Guitar Show in April and had the pleasure of meeting Frank Falbo of Falbo guitars (and inventor of the Seymour Duncan P-Rail pickup), what a nice guy! I had a nice time catching up with some friends, and checking out some neat guitars, like this Zora from GJ2 guitars. 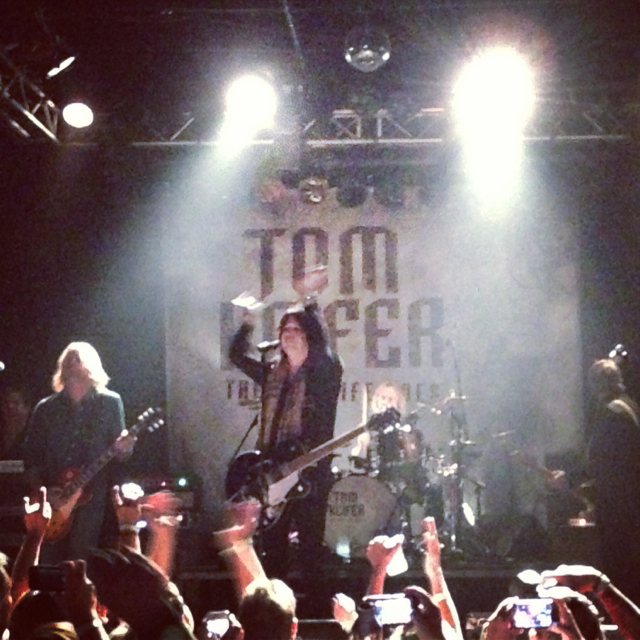 Also caught Tom Keifer on his solo tour at Trees in Dallas, which was a GREAT show! And if all of that wasn't enough, I got to spend some time with my Aussie brother, Perry Ormsby of Ormsby Guitars while he was visiting the states. 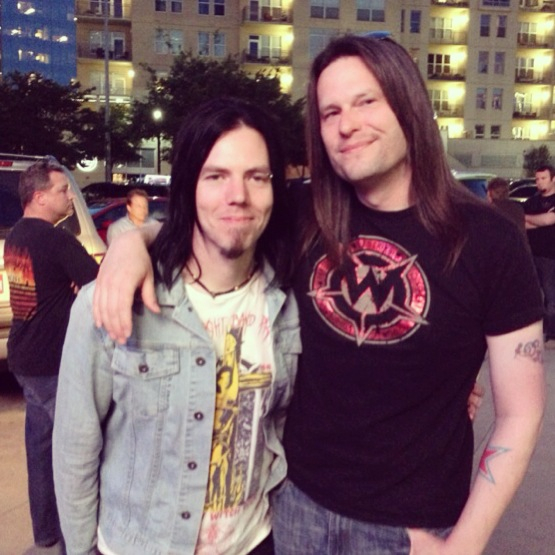 He was great enough to come to Dallas for a few days and we had a great time, for sure. He brought me a set of his Nunchucker and De la Creme pickups for me to enjoy. I plan to put then in one of the '71 prototypes and am really looking forward to checking them out. 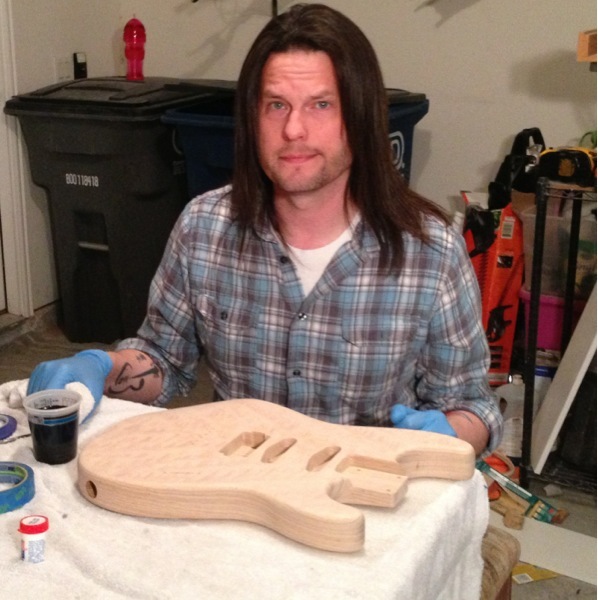 Finally, I've been kicking around the idea of offering guitar building courses, so stay tuned for more info on that develops!